With over 30 Tax Attorneys and Enrolled Agents, Optima Tax Relief has resolved over a half billion in tax debt. As a nationwide tax resolution firm, Optima can help you anywhere. FREE Consultation: (800) 536-0734. Optima Tax Relief, LLC, provides full service tax resolution for almost any IRS or state tax issue and is fully accredited and A+ rated by the Better Business Bureau FREE Confidential Consultation: (800) 536-0734 TWO-PHASE APPROACH: Our two-phase approach provides consumers unparalleled clarity into their options to resolve tax issues. 1. INVESTIGATION First, you will receive a 100% free and confidential consultation with a Senior Tax Professional. Our Tax Professionals perform an extensive investigation into the specifics of your case to identify the best possible tax resolution strategy. During the Investigation Phase our Tax Professionals can take immediate action to stop aggressive tactics such as wage garnishments, bank levies or tax liens that the IRS will sometimes use to threaten taxpayers. 2. RESOLUTION We will develop a strategy to obtain the best possible resolution for each client's specific tax situation. Full Legal Compliance To bring you into full legal compliance with the IRS, our Tax Professionals will do all the work to gather and file all the necessary documents. We Build Your Case Our Tax Attorneys have the experience to secure the best possible deal from the IRS and they will meticulously build a case to support your resolution strategy. We Present Your Case to the IRS Finally, our Tax Attorneys present your case to the IRS and position you to receive the best attainable financial outcome. Optima offers full service, nationwide tax resolution for almost any IRS or state tax issue and the company's mission is to obtain the best possible result for each client's specific situation, providing a better financial future. Our client-first ethos is reflected in the first line of their Core Values statement: "Aim for excellence. Every client. Every time. No exceptions. No excuses." The founders of Optima made it their mission to provide consumers with superior service and results. Optima's co-founders, Harry Langenberg and Jesse Stockwell, are graduates of the Wharton School of Business and have been on a life-long mission to bringing transparency and unbeatable results to consumers in sectors where there seemed to be a lack of ethical or effective providers. This unwavering commitment to ethical and socially responsible business practices has been recognized by: The Better Business Bureau Which named Optima the 2017 Winner of the Torch Award for Marketplace Ethics. The Orange County Business Journal Which named Optima a "Civic 50" honoree. Dedicated to delivering excellent representation and legal advice with regard to legal tax issues. Philip has a wide range of experience in tax law ranging from working at the South Brooklyn Low Income Tax Clinic to providing audit defense and international tax planning for multinational corporations. Philip earned his Juris Doctorate degree from Hofstra University School of Law with a concentration in Taxation Law and holds a Bachelor of Arts degree in Philosophy from the University of California, Berkeley. Vince attended Chapman University's Dale E. Fowler School of Law, where he earned his Juris Doctorate Degree with an emphasis in tax. He received CALI awards in both his Federal Income Tax and Constitutional Law II courses. He was also recognized as the Tax Law Emphasis Honor Graduate of the Class of 2015. He is admitted to practice law in California as a member of the California State Bar and is also admitted to the Central District Court of California. Vince is passionate about advocating on behalf of clients and is willing to go the extra mile in order to help resolve their tax problems. Michael graduated from Chapman University with a B.S. in Business Administration as well as a J.D. and LL.M. in taxation from the University of San Diego. He has experience in tax preparation, researching complex tax issues especially international tax issues including inversions. As a member of the RO team at Optima, his focus now is assisting clients to navigate and defend against the aggressive collection tactics of the IRS's revenue officers. results to her clients, Negar brings with her multiple years of tax resolution experience dealing with Offers in Compromise, Collection Due Process Hearings, Appeals, and advance representation involving personal and business matters. She earned her Bachelor degree in Business Administration and an MBA from the University of Phoenix. Negar also has an LL.M degree in Taxation/International Taxation & Offshore Planning from Saint Thomas University School of Law. She is admitted to practice before United States Tax Court and the Supreme Court of the State of Michigan. Carlos leverages his extensive experience working with the IRS to get the best tax resolution possible for Optima clients, helping them get a fresh start and a relief from their tax debt burdens. 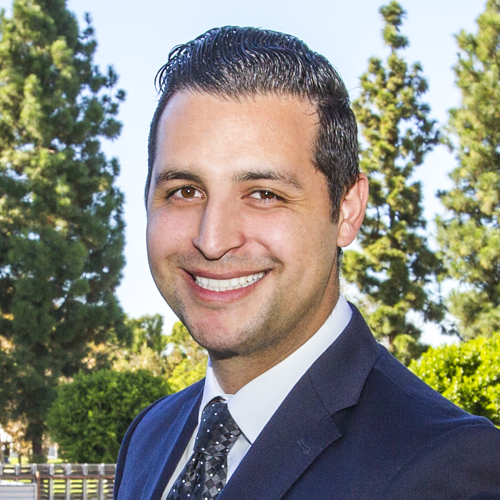 Carlos earned his Juris Doctorate degree from Whittier Law School with a concentration in Business Law and holds a Bachelor of Arts degree in History and Political Science from the University of California, Los Angeles. He is admitted to practice law in California as a member of the California State Bar and is a member of the Los Angeles County Bar Association (Taxation Section) as well as the Beverly Hills Bar Association (Taxation Section). Jenny is passionate about helping businesses and individuals resolve their tax issues and takes pride in defending taxpayer rights. She has a history of helping families in need with volunteer programs. She participated in the Low Income Tax Clinic and was an auditor for the State of California. She holds a degree in Accounting, Business Administration, and in Psychology. She is a member of the American Bar Association and the State Bar of California.